SALT LAKE CITY (AP) Confusion reigns over the Utah program as the Utes have lost four straight for the first time since 2013. 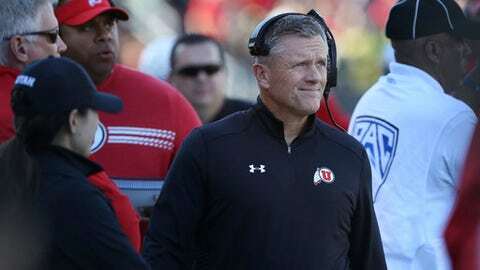 That’s the last time the team finished with a losing record and failed to qualify for a bowl game – two lowlights Utah is in danger of repeating. Whittingham and his players have struggled to pinpoint why things have gone south in the last month. The Utes have had issues in the trenches on both sides of the ball, which had been an area of strength for years. The run offense ranks No. 86 in the nation (146.75 yards per game) and the run defense is No. 57 (158.75). The red zone offense continues to be an issue and the conversion percentage is ranked No. 69. A 46.15 red zone touchdown percentage is tied for No. 117. The prevailing thought, however, is that the problems are more mental than physical. Fitts said they slowly started losing confidence over previous weeks and certainly felt it at the end of the 41-20 loss to Oregon last weekend. Both he and quarterback Tyler Huntley believe things can be worked out at practice, but mental problems eight games into a season may not be solvable during a couple days of workouts. Confidence typically comes from success and success is measured in wins and losses, or at least against other teams. Huntley stressed the need for more individual studying and film work. Utah began the season with aspirations of winning the Pac-12 South and competing for its first conference title since joining the league in 2011. Now it sits in last place in the division with a 1-4 conference record and the goal now is to send the seniors out with a bowl game. The Utes need two wins to get to the six needed to be bowl eligible and they still have No. 12 Washington and No. 25 Washington State remaining on the schedule. Utah hosts a UCLA team Friday that is in a similar situation at 4-4, fourth in the South Division (2-3) and needing wins to secure a bowl.